I wish I could fully articulate the numerous ways the Fulbright program has changed (and continues to change) my life. 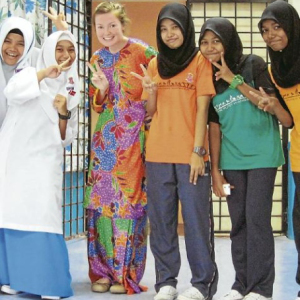 My year teaching English in an industrial Malaysian community was not the beach vacation many might assume; I lived with a Malaysian in public housing without hot water, air conditioning, screens on my windows. Students and teachers regularly asked me about America, a country they see in the news and online all the time but that few have or ever will visit. They were surprised to hear that there are Muslims in the U.S. They giggled when I tried to speak their language while simultaneously offering a hospitality to me that has yet to be matched in any part of the world I have visited. I’m not sure how many words of English my students learned while I taught at their school, but I know for a fact that the kids I saw at the beginning of the year who were petrified to talk to me (the first Westerner they’d ever seen) ended the year with a completely different understanding of me, my country, and how they thought about their own roles in our shrinking world. In my very biased opinion, there is no better way that our government could spend money to promote understanding between cultures. It is integral to our nation’s interests, and it is integral to the global community.